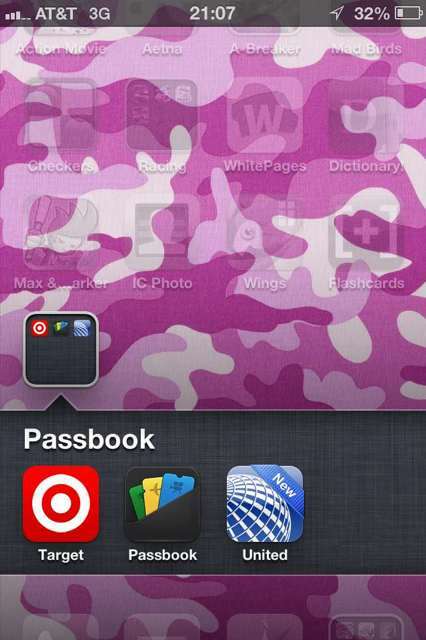 When you go to passbook you can click a button to go to the app store and see a list of compatible apps. But, once you add a "pass"into passbook you lose the option to click a button and go to the App Store to see a list of compatible apps. When you try to go to the App Store and search for apps that are compatible with passbook you can't find anything. So I think it is necessary to create a thread listing apps that are compatible with passbook so that we can use it as a reference. Please list apps that are compatible with passbook that you are aware of, that have not been listed yet. Thanks and I hope this helps everybody. American Airlines and United Airlines both have Passbook enabled apps. I go to passbook and tap the "app store" bar at the bottom to add some and it always comes up with the error "cannot connect to iTunes Store".... Anyone else having this problem?? Help? I go to the App Store and add a pass book app and it just adds the app to my phone and the passbook app doesn't change. It's something within the app. For example, in the Target app you have to sign up for mobile coupons and you get an option to then add the coupons to Passbook. I'm assuming, but don't know for sure, that you can then delete the app and you will still get updates to the Passbook. Some stuff like airline tickets may even just be an attachment to an email that you click on to add to Passbook without needing an app. on the podcast Rene indicated that you didn't need the actual app. That basically you could come across a passport link anywhere, email, website, in an app and it sends, i guess, a file into passport. but he claims you don't need the app really. He explains it in techno speak which honestly i don't even want to understand about something called like jaysons or something. don't care about that. But i think the way it may work is like you buy movie ticket on your phone and fandango just adds it to your passbook, or you get a buy a gift card and amazon sends you a reciept with a link and from your phone you click the passport link and it sends the the giftcard to passport and now you can use that instead of the actual physical card. i'm just guessing but that's how i understand it. And i know there's some fancy way to add your starbucks card on there even though it's not available through the app yet by going to some website and i guess creating a link to your starbucks card. i don't fully understand it and i'm not going to some unknown site but i read that that's what people did during the beta test. I'll just wait as i'm paranoid about my money. but here is a link to Rene explaining it. The current implementation for adding stuff to your passbook seems... lacking. I don't want to have to download a new app for every single item I want to add. That pretty much defeats the entire purpose of having a single repository for all this stuff. For example, I have loyalty cards with many stores, including Kroger, CVS, Best Buy, Freebirds, Landry's, and a ton of others that I don't always carry around with me because that would make my wallet about 5" thick. I should be able to just open my passbook app and add all of these cards right into it. Why can't I do that? i agree Big Dookie. I know passbook was a "ticket" feature, but i thought it could do what you pointed out. not really seeing the benefit of passbook. sure its all in 1 spot, but when i fly out or go to the movies, im not shuffling around a bunch of tickets on the same day. i pretty much just need to use the app involved for my task. i think NFC would have been more useful, but I understand that's a hardware improvement. anyhow, i guess i'll be using cardstar again for my loyalty cards. so this is awesome, 2 of the top 5 new features turned out to not be so helpful after all (maps & passbook). maps might be an improvement for some. for me not so much cause i need transit directions and better local business search. 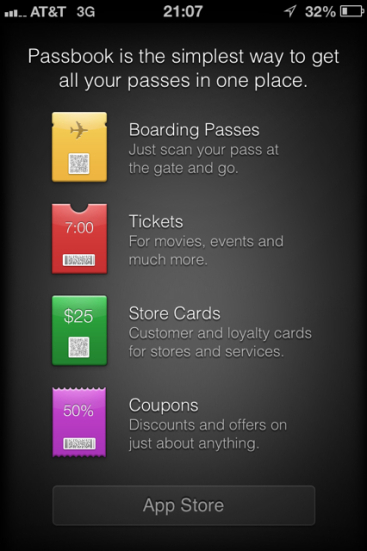 As soon as apps update to include themselves in Passbook, you won't need the apps anymore. You'll be able to log onto your account online and click a button to add your loyalty card or ticket/coupon to Passbook. That's actually how the Sephora one works now. Yup. Lol thanks to my wife (maybe) She tried it last night and it wasn't working right. The link to add to passbook was linking else where. She emailed them last night and boom, it started working this morning. I installed both AA and United apps through the Passbook app, but neither one has a button in the app to "Add to Passbook"... Do you have to have a boarding pass to get that function? Not working as advertised... Very disappointed. Others, SPG and Starbucks do work. Trying others but doesn't look like all apps advertised are consistent. Passbook has been more of a flop than a must have feature. There aren't many partners signed on yet. Hopefully that'll change, but if they haven't come on yet, it's probably gonna take a while. By the way, you can add Dunkin' Donuts to the list of Passbook supported apps. You can read about it HERE. I agree. Apple Passbook is pretty stupid. I use the app called Key Ring, which can scan in ANY barcoded membership card and then duplicate the bar code when you need to have it scanned. Works great for grocery store cards, library cards, gym memberships, etc.